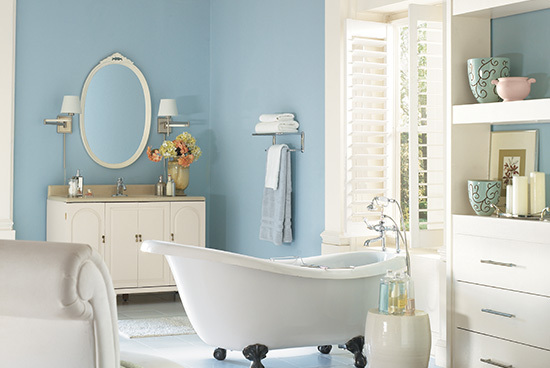 Light blue paint can quickly turn any bathroom into a peaceful retreat. It is ideal for a softer vibe and can be considered a calming and atmospheric bathroom color. Try using Bit of Heaven PPG1156-2 for a lovely blue bathroom paint color. Atrium White PPG1020-1 works wonderfully as a trim color, and accents can include Geyser PPG1138-2 and Delicate White PPG1001-1. Pairing subtle off-white paint colors in a traditional bathroom can be a great way to create a soft and delicate space. Vanilla Milkshake PPG1015-1 combined with Sugar Soap PPG1084-1 are ideal bathroom colors. Use Delicate White PPG1001-1 for a clean trim and Dark Granite PPG1005-7 for accents and decor to create contrast.